You sit glaring at the screen, thinking that there must be some mistake. Maybe if you refresh a couple times, it will fix itself. You came up with a creative business name, have your new logo design, and even snatched the Facebook page and Twitter handle, but after a search for the right domain, it’s taken. If someone else owns the domain, what can you do? This happens, as getting the perfect domain, although such a seemingly small task, can be one of the greatest challenges you’ll have in building your digital presence. Find out what it means if your domain is taken, and the next steps you can take to secure one for your brand. Why is my domain taken? Some businesses or entrepreneurs make a living on domaining. They purchase a list of domain names to make money by following current trends, interests, or habits. For instance, if someone purchased www.KanyeforPresident.com, they’d be domaining on the chance that Kanye West will actually run for President of the United States in 2020. A domainer takes a small risk by investing in the domain and paying for its annual fee, but there’s no promise he or she will be able to profit from that domain. In this case, someone domaining is betting on the chance that Kanye West, a big star with millions of dollars, would pay him or her thousands to secure that domain name. What can I do if my domain is taken? Sometimes, the domain name may have been purchased by a legitimate business owner, but they never ended up doing anything with it. If that’s the case, you can use the Domain.com WHOIS lookup to explore if you can contact the owner of the domain and purchase it at a fair price. You may have to pay a premium, but it’s worth a try to grab the perfect domain. You can still get the point across and convey your brand by using an abbreviation of your business name in the domain. For instance, instead of www.AcmeCompany.com, you may opt for www.AcmeCo.com. The easiest way to try out abbreviations is to open up your word processor and create a list of potential abbreviations. Then, copy and paste that list into Domain.com’s Bulk Registration tool to see what is available. Without compromising the integrity of your domain name, you can simply change the domain ending (aka the top-level domain). Of course, the most used top-level domain is .com, but you have a variety of top-level domains at your fingertips, including .net, .biz, .co, .business and more. Using a top-level domain that applies to your business will help to further convey your brand and the products or services you offer. Instead of www.yourbusiness.com, consider using your tagline or slogan instead, assuming it’s short. A realtor client we’ve worked with for quite a while opted to purchase www.DependonDakota.com because her slogan played into her brand, and it was easy to remember for everyone who had seen her marketing campaigns. Another example, Nike uses www.JustDoIt.com and points traffic using a redirect to www.Nike.com. Believe it or not, this type of situation comes up every single day. If you’re currently working with a web design expert, then lean on them to help you navigate this new domain terrain. 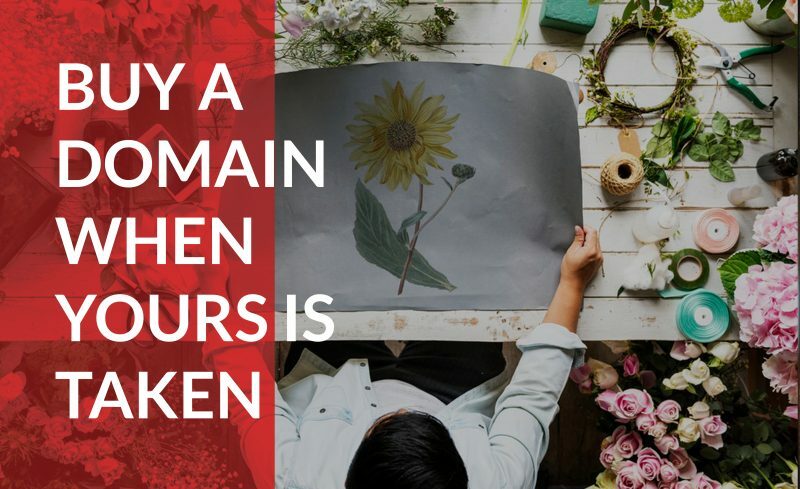 Chances are your web designer has run into this situation before and can come up with some creative ideas to find you a domain name that fits your brand. You may find yourself at a digital chasm with your domain taken, but it’s not the end of the world. Whether a professional domainer, a fellow business owner, or a domain squatter currently owns your ideal domain name, the steps above can help you attach a relevant and professional domain name to your website. Stop helplessly glaring at that screen, and start getting your brand or business a piece of the internet.